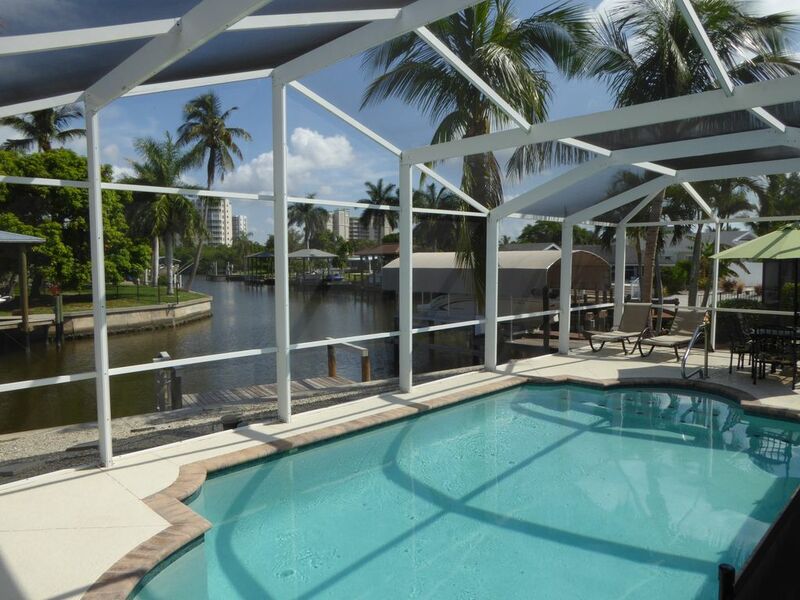 **Waterfront Home PVT Pool- Across the Street From Beach- Great Shelling! Relax and Enjoy-Welcome to the Pink Shell House. Our Home is located Directly across the street from the GULF OF MEXICO! Additionally our home sits on a beautiful wide canal. You have your own private pool that is solar heated . The home has lots of Natural light. The kitchen is open concept and has everything you need for entertaining . We have guests who literally travel from all parts of the world to come to our location to go Shelling . So many things to do additionally like; take a walk to Lover's Key State Park where you can enjoy fishing, kayaking,and boating. Beach chairs, towels, and umbrellas are provided. Our dock can handle boats up to 25 feet long, and the location at the south end of the island provides 5 minute access for boaters to the bay and gulf. After a fun day at the beach, relax on the loungers by the pool and feel the stress melt away. If you are lucky, you may even catch a dolphin or manatee sighting in the canal. You are conveniently located near shops, restaurants, marinas, theatres, and a golf course. A Trolley stop is located in front of our home taking you to the pier at Times Square, shopping and restaurant complex. Daytrip it to beautiful Sanibel, Captiva and Naples or enjoy some of the tourist attractions in Fort Myers. We love the tranquility of the Pink House's location; being on the peaceful south side of Fort Myers Beach with quick access to the bay, gulf, and beach. We fell in love with the house (we painted pink) when we first saw it. We vacation at the Pink House and hope that you can enjoy it as much as we do. One of the most unique benefits of the Pink House is its private location directly across the street from the beach!! Located on the south end of the island allows for easy access on and off the island! A beautiful canal view off the back of the house and a private pool that is solar heated . You may spot manatees, ospreys, and occasionally dolphins in the back canal. Lover's Key is a short walk over the bridge. Numerous restaurants within a mile and some of the best fishing, kayaking, canoeing, and beaches make this a great place to vacation. Walk across the street and the Gulf of New Mexico will meet you! Our Home is available in a very accessible location on the island - we are considered South Island which is very convenient for getting on and off the island quickly.